﻿ SAS Management Inc.COBIT® 5- IT Governance - SAS Management Inc.
COBIT 5® provides a comprehensive framework that assists enterprises in achieving their objectives for the governance and management of enterprise IT. This helps enterprises create optimal value for IT by maintaining a balance between realizing benefits and optimizing risk levels and resource use. Control Objectives for Information and Related Technology (COBIT 5) is a globally accepted framework for the governance and management of IT. It aligns business goals to IT processes and goals, providing tools, resources and guidance to achieve, identify and associate responsibilities of business and IT processes. COBIT 5 stimulates innovation in IT, bridging the gap between control requirements, technical issues and business risks. Gain knowledge, experience and skills to adapt and apply COBIT 5 metrics and maturity models to an organization of any size and sector. Understand relationships between business IT systems and associated cybersecurity risk. Help set priorities and business requirements in accordance to security and risk levels. Assist in making informed decisions and taking appropriate actions to reduce security risk. Implement tools, resources and guidelines to improve prevention, detection and recovery of cybersecurity. Provide a clear overview of internal IT roles and responsibilities in cybersecurity, giving an organization a competitive advantage. Help optimize the cost of IT services and technology, through the integration of an improved and enhanced operational IT system. Assist in compliance with relevant laws, regulations, contractual agreements and policies. Provide clearer vision and understanding of cybersecurity risks, allowing improvement and scope to be implemented. Contribute in increased user satisfaction, through an improved integration of information security measures and outcomes. Enable a faster route to achieving strategic business goals and benefits, through the effective and innovative use IT. Gain a holistic understanding of the governance and management of an organization’s internal information systems and technology. Provide top management with an overview of current IT enterprise findings, identifying key problem areas of improvement. 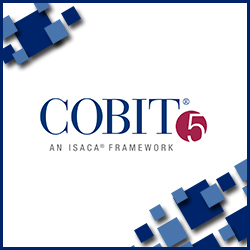 Recommend improvements, by implementation aspects of COBIT 5. Download the syllabus to find out more about the content of the COBIT5 certification. Effectively analyze business IT operations. Source the root of problem areas and implement change through scope and plan. Assess and resolve current process capabilities. Implement the latest good practices, in order to avoid future risk and process capability delay. Approach, plan and implement improvements using good practices. Implement one framework to support all IT management capabilities. Use COBIT 5 metrics and scorecards to create a performance measurement framework for an organization. Perform and process capability assessment using COBIT 5 guides, models and methods. Brief team members with clear plans and structure. Identify roles and responsibilities in the process capability assessment process.